Almost everyone knows that Orville and Wilbur Wright were the first to fly using an engine and wings. This happened in 1903 in Kittyhawk North Carolina. However, the airplane they flew there had some serious drawbacks. First, it was very unstable. Second, it couldn't turn in a circle. It pretty much rose off the ground a few feet and then came back down in a straight line. The Wright brothers realized the problems facing them and had to make a tough decision: keep working on their aeroplane as a hobby as they had been, or devote themselves full time to developing a workable (and saleable) aircraft. They chose the later. Upon returning to Dayton in late 1903 they set about making plans on how to accomplish their goal. They realized that they couldn't continue operating their printing business and bicycle manufacturing shop AND build an aeroplane that worked. They closed their business operations and devoted themselves full time to refining their flying machine. 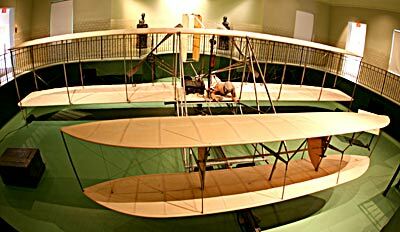 The results of the those efforts was the Wright Flyer III. The improved Wright Flyer III put the elevator controls and pitch under the pilot's control. They increased the elevator surface area by over 50% and, more importantly, extended the elevator assembly 5½' farther forward. This change moved the center of mass forward and lengthened the moment arm through which the elevator acted. The relocated center of mass made the craft less likely to pitch up and down, and the increased length made the plane less sensitive to minor elevator movements, which reduced pilot over-correction. In addition, the Wrights decided to give the pilot independent control over the axes-pitch, roll and yaw. Heretofore the rudder had been connected to the wing-warping control and both moved together whenever the pilot moved the hip cradle. They added a second control handle-the first one moved only the elevator-so the pilot could pivot the rudder independently. To reduce the nose dropping in turns they added two vertical, semicircular vanes they called "blinkers" between the two elevators. These changes took some getting used to in flight, but the Wrights realized a vast improvement in performance from the first flight of the rebuilt Wright Flyer III on August 24, 1905. Within a week, Orville had completed four circuits of the field, remained aloft for almost five minutes, and landed back where he started without crashing. Most importantly, they finally had decent control over pitch and the dangerous oscillations. Soft, controlled landings became the norm, as did increasingly longer flights. Once again, on October 5, 1905, Wilbur flew until his fuel was exhausted, only this time he had enough to remain aloft for 39 minutes, 24 seconds, covering slightly over 24 miles, a distance longer than all of the previous 109 flights put together. Unlike anything else in the world, it could take off, climb into the air, fly for extended periods in any direction completely under the pilot's control and land in a safe, controlled manner. And it had shown that it could do all of this over and over again. While some fundamental changes in airplane design would come in the future, the primary one being the relocation of the elevator to the tail of most planes, the basic concepts proven by the Wrights with Wright Flyer III remained the foundation for these designs. In 1947, Edward Deeds, then chair of Dayton's The National Cash Register Company, asked for Orville's help in selecting a machine for display. Wright eventually recommended that a Wright Flyer III be rebuilt for the exhibit and in the spring of 1947 oversaw every detail for authenticity. Eighty percent of everything except the fabric was original. Some new parts had to be fabricated to replace missing or destroyed originals. An original 1905 engine was reinstalled, though with a new crankshaft and flywheel (parts of that engine had been taken to restore the 1903 engine some years earlier). The restoration took more than a year to complete and it was one of the last projects that Orville oversaw. Orville Wright died January 30, 1948, just 2 years before the completion of the aviation hall where his Wright Flyer III would be displayed. The restoration was unveiled to the public at a grand ceremony on June 3, 1950. Since then, the Wright Flyer III remains one of the most significant artifacts in aviation history.